As for the Isley Brothers, the Spinners biography includes neglect by Motown, a single big hit, and monster success at a different label. Though most of their classics came from Philadelphia, their patient climb started just north of Detroit. 1957: Ferndale, Michigan. Five high school students: Pervis Jackson, Henry Fambrough, Billy Henderson, Bobbie Smith, and C.P. Spencer. A doo-wop group: The Domingoes. Some talent-contest wins. Spencer's replacement by George W. Dixon. A contract with the Tri-Phi label and Harvey Fuqua, who was seeking another Moonglow-like group. 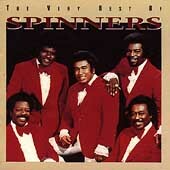 A name change inspired by Smith's chrome car accessory: The Spinners. A 1961 R&B hit, "That's What Girls Are Made For," featuring Fuqua. Dixon's departure, Edgar "Chico" Edwards's arrival. Hitlessness during the R&B/pop flux of the early 1960s. Edwards's exit, G.C. Cameron's entrance. 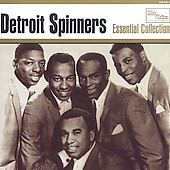 The steady steps in this Spinners biography now give way to one big leap--to Motown! When Berry Gordy's company purchased Fuqua's, the Spinners (or "Detroit Spinners" to U.K. fans) entered the strengthening pop-soul hurricane. And got stuck in the storm's calm eye. In the mid-'60s, Motown was busy pumping up other artists like the Temptations, Four Tops, and Supremes. So the Spinners kept plodding along. R&B charters "I'll Always Love You" and "Truly Yours." Work as backup singers to brighter stars. Jobs as chauffeurs to brighter stars. Musically, commercially, their wheels kept spinning but took them nowhere. Until 1970, with "It's a Shame." Stevie Wonder's songwriting. His and the Funk Brothers' instrumentation. G.C. Cameron's lead. Jackson-Fambrough-Henderson-Smith's harmonies. Result: Pop recognition at last! But even that is not the happy turning point of this Spinners biography. Motown did not clamber to capitalize on the group's triumph. In 1972, instead of rising through the ranks, the Spinners watched their contract expire and fell off the company roster. Then, Cameron took his leave. Phillipe Wynne (born Philip Walker) took his spot and took the lead vocals to a loftier falsetto pitch. From vigorous Motown soul to polished Philly soul: Atlantic Records signed the Spinners. Now the Spinners biography opens to a new chapter. After a few disposable tracks, the ex-Motown singers teamed up with composer-arranger-producer Thom Bell and his writing partner Linda Creed. Result: Sustained pop recognition at last! No, not mere "I've heard them somewhere!" recognition. From 1972 to 1977...from "I'll Be Around" to "Could It Be I'm Falling in Love" to "Ghetto Child" to "Games People Play"...from smash singles to Top 20 albums, Phillipe Wynne and the supporting Spinners flourished as one of the biggest pop and soul music acts of the 1970s. 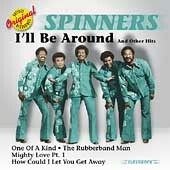 Besides their sweet orchestrations, mild funk, and suave romanticism, the Spinners could also pull off physical acrobatics with a popular novelty song like "The Rubberband Man." Aptly, the group remained resilient when Wynne left it--and his clashes with the producer--behind in 1977. The slowdown had begun. With John Edwards, the Spinners stretched their streak a little with disco takes on "Working My Way Back to You/Forgive Me, Girl" and "Cupid/I've Loved You for a Long Time." The next decade, the chart splashes only got tinier. So like many of its contemporaries, the group started spin--oops, recycling its soul classics for aging and newly initiated fans. Phillipe Wynne, meanwhile, found more solid spiritual footing as a minister and modest singing success, at least in concert with Parliament-Funkadelic or solo. He would not enjoy it for long. During a 1984 show in Oakland, California, partway through an encore, a heart attack felled the singer. He died at age 43. Yet the Spinners biography rolls onward. The quintet continued to release records, perform onstage, and earn the respect it had missed at Motown. In 1999, the Vocal Group Hall of Fame made that esteem official and permanent. After Edwards's departure due to illness, they came full circle in 2000 with the return of G.C. Cameron. He himself left for the Temptations in 2003, opening the lead spot to former Future and Delfonic Frank Washington. With the deaths of Billy Henderson (who'd been out of the group since 2004) on February 2, 2007 and Pervis Jackson on August 18, 2008, Henry Fambrough and Bobbie Smith continue as half of today's touring foursome. It's a shame Motown didn't nurture them when it had the (nearly decade-long) chance. But the Spinners had been down too long there, and they had nowhere to go but up. Up with Wynne's falsetto. Up the charts. Up to the top of the pop-soul music pantheon. Longing just a little for Motown oldies singers after this Spinners biography? See the homepage!